Summary: In this well-written, engaging book, author Jim Collins describes six critical factors that he and his research team found common in companies that transformed themselves from a long period of mediocre or bad results to a long period of great financial results. Although focused on publicly-traded companies in the United States, the results of this research can easily be extended to apply to other types of organizations. Level 5 Leadership: personal humilty and professional discipline in an organization’s leader are the starting point for the transformation. First Who… Then What: don’t worry about what to do until the right people are in the right positions in an organization. Confront the Brutal Facts (Yet Never Lose Faith): careful and honest examination of an organization’s current situation is the foundation for finding a path forward. The Hedgehog Concept (Simplicity within the Three Circles): discover a simple business concept that people can be passionate about, that works with a single key economic driver and that the organization can be the best in the world. A Culture of Discipline: disciplined people removes the need for heirarchy, disciplined thought removes the need for bureaucracy and disciplined action removes the need for excessive controls. Technology Accelerators: pioneer the application of carefully selected technologies without relying on technology for transformation. Some of these concepts are very close to the underlying principles of agile work. For example, in the Scrum methodology, the first five principles are all represented. The Scrum Master embodies some of the attributes of level 5 leadership. A self-organizing team gets the right people in the right position. The daily scrum and the sprint planning meetings are designed to help the team confront the brutal facts. The sprint goal embodies at a local level the simplicity of the hedgehog concept. And the practices in general are a manifestation of a culture of discipline. Who Should Read this Book? Anyone interested in creating a lasting positive transformation in an organization should read this book. 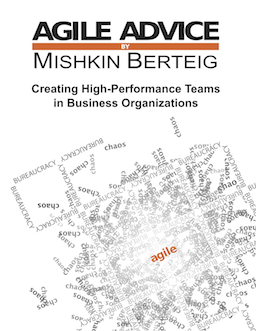 In particular, individuals who are coaching teams or organizations should read this book since the concepts also appear to apply at a sub-organizational level.